This week’s Highlands real estate spotlight is on 480 Satulah Road. This historic Satulah Mountain home was built in 1935 and oozes with charm. From the spectacular views to the private setting you will see immediately what drew the original owners to build here. If you have been looking for the ideal mountain getaway look no further, this Highlands home is a must-see. 480 Satulah Road is a four bedroom, 3 bath home on a lot that is nearly two acres in size. Inside this lovely mountain home are wood floors, tongue and groove wood ceilings. The main level has two bedrooms with a bath and another small bedroom/office with a full bath. The lower level has two small bedrooms and a full bath. Outside you will find a detached two car garage with a lower level room that could be converted to a guest quarters. 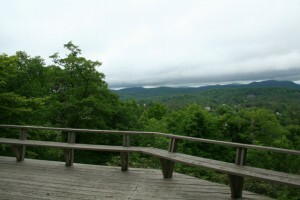 The panoramic mountain views are visible from inside and out. The home could use some updating or offers a perfect spot on which to build a new home. Contact me, Lynn Kimball, today to schedule a private showing of 480 Satulah Road or any other Highlands property currently listed for sale. My goal is to help you locate a home that suits your needs and your lifestyle. how much is this property and are there any pictures–any other homes in that historic area for sale?? ?